STRADA (AUS) (Bay 2002-Stud 2007). 4 wins at 1100m, AJC Eskimo Prince H., L. Sire of 220 rnrs, 136 wnrs, inc. SW Hioctdane (SAJC Chairman's S., Gr.3), Lucky and Wealthy, Settle Strada, Gold Broker, Mister John, Charm's Honour, SP Formidable, Stradon, Sweet Kiss, St Blackberry - Luenyat Blackberry (Mac.) and of Filjon, Painte, Vector Change, Dukes Bar - Let Me Do (H.K. ), Grande Punto, Sir Joey, Stradam, Free the Wind, G'Day Kitty, etc. Chabrier (g. by Strada). 2 wins-1 at 2-at 1200m, 1600m, 3d MRC Ahern's at Highways After the Last H., MRC (Mornington) Orbit Fitness H.
Larry's Song (g. by Hurricane Sky). 6 wins to 1400m in Aust. Second String (g. by Brahms). 5 wins to 1200m, A$83,720 in Aust. Phoebe's Lass (f. by Strada). 2 wins. See below. Turf Magic (g. by Magic Albert). Winner at 1100m in 2014-15 in Aust. Honour the Code (f. by Honours List). Placed at 2 & 3 in Aust. Lodgent. 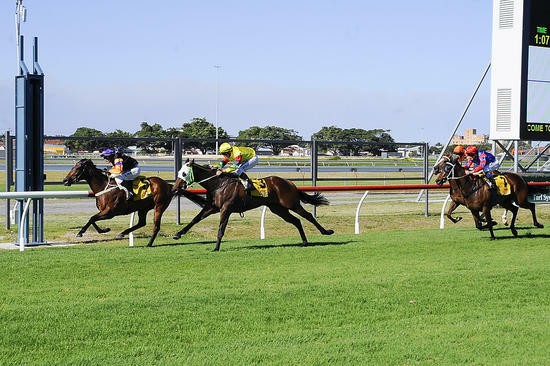 9 wins-1 at 2-from 1000m to 1800m, A$193,280, AJC Autumn Country Cup, Elma Projects H., CVD Function Centre H., City Tatt's RC Konami Australia Pty Ltd H., STC Bidvest H., 2d STC Bradley Australia H., Singapore Turf Club Trophy, Pentathlon H., Grandstand Reserved Seating H., Tip Top Bakeries H., 3d AJC Kokoda 2YO H.
Mr Magic. 4 wins at 1100m, 1200m, WATC Budgies Gym Hard & Healthy Program H., 2d WATC Perth Racing Members H., Westspeed H., 3d WATC Tabtouch.mobi H., BMW X5 H.
My Point. 4 wins from 1050m to 1600m, WATC Betty Kuipers 30 Years H., Alan Meehan 25 Years H. Producer. Aubade. 4 wins. See above. Tudor Magic. 2 wins at 1100m, 1200m, AJC Daily Telegraph H.
Crown Seal. 7 wins to 1200m, A$95,200, 3d AJC Meridan & Thomas Hotels 2YO H., Gold Edition H.
Pismo Beach. 8 wins to 1200m to 2014-15 in Aust. Closed Caption. 3 wins at 1550m in Aust. Seal of Approval. Winner at 1200m in 2015-16 in Aust. PLAYING GOD (Blackfriars). 8 wins-1 at 2-from 1100m to 1800m, A$1,669,200, WATC Kingston Town Classic, Gr.1-twice, Western Australian Guineas, Gr.2, Northerly S., Gr.3, Aquanita S., L, Magic Millions Perth 3YO Trophy, Westspeed 2YO P., Westspeed 3YO H., 2d Western Australian Derby, Gr.1, WATC Goodwood Sprint H., L, Raconteur S., L, Fairetha S., L, 3d VRC Australian Cup, Gr.1, Turnbull S., Gr.1, Australian Guineas, Gr.1, MRC CF Orr S., Gr.1, WATC Prince of Wales S., Gr.3, Roma Cup, Gr.3, Westspeed Nursery H., 4th MRC Futurity S., Gr.1, WATC Railway S., Gr.1, Kingston Town Classic, Gr.1, VRC Makybe Diva S., Gr.2, WATC Strickland S., Gr.3. GOD HAS SPOKEN (Blackfriars). 8 wins-3 at 2-from 1100m to 2100m, A$1,189,250, WATC CB Cox S., Gr.2, RJ Peters S., Gr.3, Strickland S., Gr.3, Sires' Produce S., Gr.3, Aquanita S., L, Westspeed 2YO P., Burswood is Entertainment 2YO P., Support Your Industry Bet Local Welter H., 2d WATC Kingston Town Classic, Gr.1, Perth Cup, Gr.2-twice, Lee Steere S., Gr.2, Asian Beau S., Gr.3, JC Roberts S., L, Westspeed 3YO H., Puntathon March 20 H., 3d WATC Kingston Town Classic, Gr.1, Strickland S., Gr.3, 4th Western Australian Derby, Gr.1. MOOBALL (Sanction). 10 wins from 1000m to 1800m, A$260,350, MRC Lord S., L, Wangaratta Cup, VRC Longines P., MRC Basha Felika H., 2d Seymour Cup, L, 3d Wangaratta Cup, Wodonga Cup, Bendigo JC Amerind H.
Race Record: 10 Starts 2-1-1 A$33,955. 2 wins at 1200m in 2015-16 in Aust.